WGIRLS Chicago launched July 2017, welcoming our initial members and setting out to establish ourselves as the premier non profit group for Women & Children in Chicago. Since our launch we have continued to expand our reach across the city of Chicago, volunteering, fundraising and advocating, raising awareness and donating thousands of dollars in our first year. Our Chicago Chapter is constantly working to meet the needs of the disadvantaged and at risk in our community. Along with volunteering and fundraising efforts, we are always looking for personal development opportunities and to provide an environment to foster personal and professional relationships among WGIRLS. If you think that you would like to join other like-minded WGIRLS in our efforts to empower and uplift please reach out. Please see the links at the bottom of page if you are interested in partnering or becoming a member. WGIRLS Chicago is dedicated to “Empowering Women and Children” in the Chicago community. We encourage you to attend one of our events. Each month, our members are exposed to multiple volunteering opportunities, a social, and an event that focuses on fundraising or professional development. In addition to our monthly events, WGIRLS Chicago looks forward to our annual Hope for the Holidays Gala. Email us to learn more about WGIRLS Chicago membership. 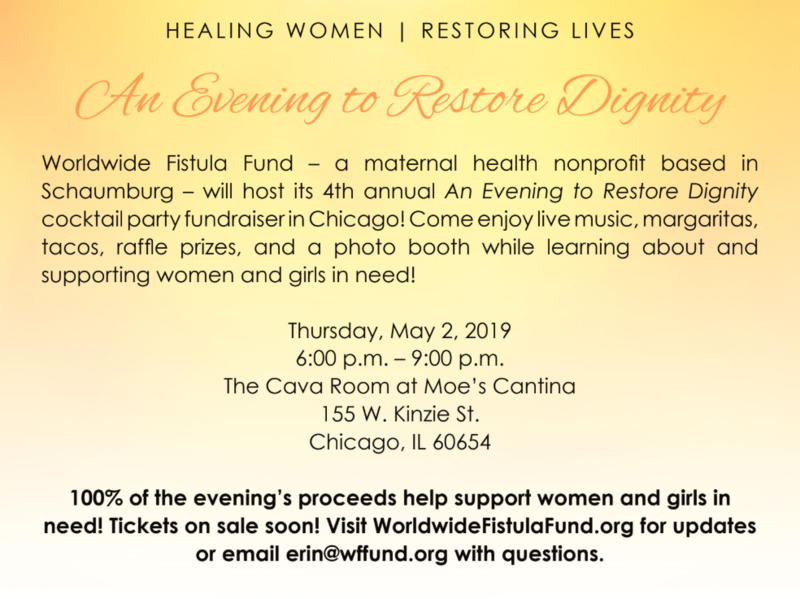 The Cava Room at Moe’s Cantina | 155 W. Kinzie St.
100% of the evening’s proceeds help support women with childbirth injuries in Africa. Copyright © 2018 WGIRLS Inc.